Morning folks – just about – hope you’re having a lovely Monday? Mine is just grand, although from an Arsenal perspective there’s very little on as the team prepare for a MASSIVE CRUNCH TIE IN DUBAI tomorrow. It’ll be interesting to see how many of the first teamers and how many of the youth get a chance to impress the boss tomorrow. No doubt it’ll be a smattering of both to keep sponsors happy, but with such talk of the impressive nature of our youngsters coming through, you do wonder how seriously the manager views some of them as prospects for next season or beyond. The challenge somebody like Emery has at a club like Arsenal is that he can’t afford for his tenure to be known as the breeding ground for talent. The man has a two year deal and the reason he’s probably only just been given that is because the club need him to get them in to the top four and he has very limited opportunities to do it. So with just 24 months to convince that he can take Arsenal forward, would he really risk blooding too many youngsters given such a short timespan to get results? He’s done it with Guendouzi and clearly Maitland-Niles is a player he rates. 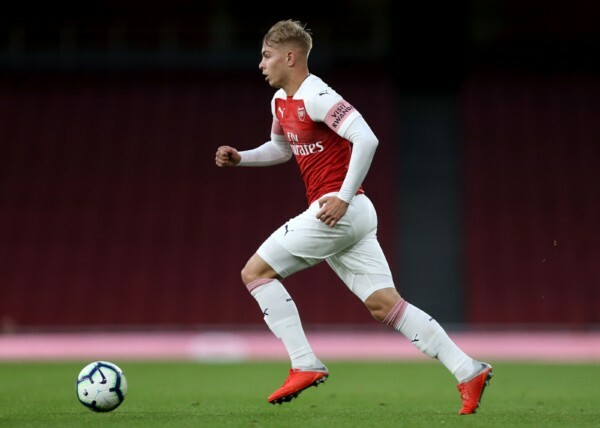 Emile Smith-Rowe got a shot before going out on loan earlier this season but how many more players could Emery feel like he could give a shot to, whilst still being competitive in the race for top four? My guess is that there are a few players like Amaechi who will probably be looking abroad at an opportunity to arise and with Nelson and Sancho paving the way in Germany, they’ll want to know what serious chance they have with Arsenal in the next 15 months or so. My gut feel would be little. Arsenal is a club that could probably afford to bring through three or four youngsters as regular attendance makers in the first team, but if next season we’re looking at Nelson, Smith-Rowe, Guendouzi, Maitland-Niles, how many more young players are going to get a shot? We’ve already seen how limited Nketiah’s game time has been and I don’t see the other players at the club getting loads more time as they progress through this season and next. So I suspect something has to give and I suspect it will mean that most of this supposed ‘golden generation’ of players coming through will have to ply their trade elsewhere. The thing is though, having seen Gnabry break through in Germany this season, how frustrating could it be that we could have one of our own do the same? What can you do though? We can’t exactly stockpile players because even if we did they’d have the same situation that Hudson-Odoi is going through right now where he’s already running his contract down. That’s the last thing we want but with a manager unable to make large-scale changes and bringing in young players (and why would he, as I mention above? ), then something surely has to give. A lot will also depend on Champions League qualification this season too I suspect. If we get there then the manager has a bigger pot to bring in his type of players and it probably makes it harder for a youngster to break through. But if the purse strings are being tightened because we don’t get Champions League football, perhaps we might see more of these players next season than we think? Tomorrow will give us a glimpse of some of them but the next few weeks will probably define how much of a chance they get in the first team.